Ramkumar Chatterjee is regarded as the repository of Bangla Puratoni Gaan (old Bengali songs). It was he who popularized the genre of Bengali Baithaki songs. Hailing from a strong musical background as his grandfather, himself a classical singer, wanted young Ramkumar to learn tabla as it would help him to develop an ear for musical notation. However, the prized moment came later when he got an opportunity to accompany Kazi Nazrul Islam during a public meeting held by Netaji Subhash Chandra Bose at Hedua in north Calcutta. 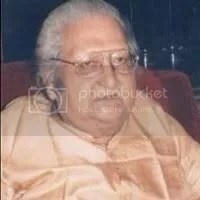 Sharatchandra Pandit popularly known as ‘Dadathakur‘ appointed him as a singer at the radio station after a short voice test, which he cleared, and started singing. He was given five rupees per song. I pray the Almighty that our ancient Musical culture will not deminish. The educational institutions should look in to this subject. Add music also as an optional subject or a choice for 3rd language starting from 9th standard. And to encourage the students allot some additional marks to the total of all the papers in every final examination. Thanks for educating us with Musical stalwarts like Ramkumar Chatterji. We expect some more nice pleasant articles like this. Your efforts for the preservation of ICM are really app-laudable. Kindly upload any thing by Amanat & Fateh Ali Khan, if you have any spatially recorde in India. he is superb… I am proud of myself as an bangali.. I am proud to be an Indian for having so many Legends.